yields under microwave irradiation has been described. transistors (FETs)  have been reported. to be recovered, treated and disposed of. presence and absen ce of LiCl salt were utili zed ( Ta bl e 1). ble 1, Entries 4 and 17). lents was identified to give the similar results (Table 2). has been efficiently produced (Table 3). HOAc (0.5 mL) under microwave irradiationa. aPyridilphenyl ketone (1 mmol), para-methylbenzaldehyde (2 mmol) and ammonium acetate (6 mmol). a Using microwave irradiation HOAc/LiCl at 3 min; bref  . matography t o aff or d p ure p ro duct s.
from the Research Council of the University of Isfahan. 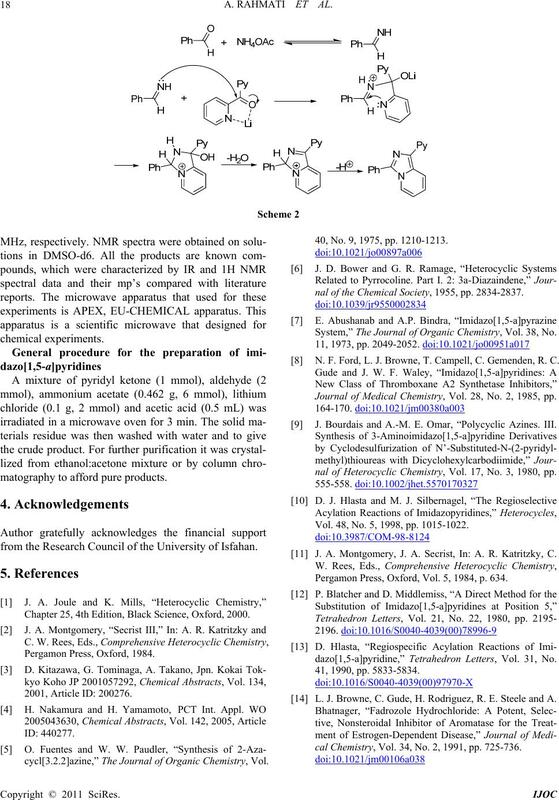 Chapter 25, 4th Edition, Black Science, Oxford, 2000.
cycl[3.2.2]azine,” The Journal of Organic Chemistry, Vol. 40, No. 9, 1975, pp. 1210-1213.
nal of the Chemical Society, 1955, pp. 2834-2837. 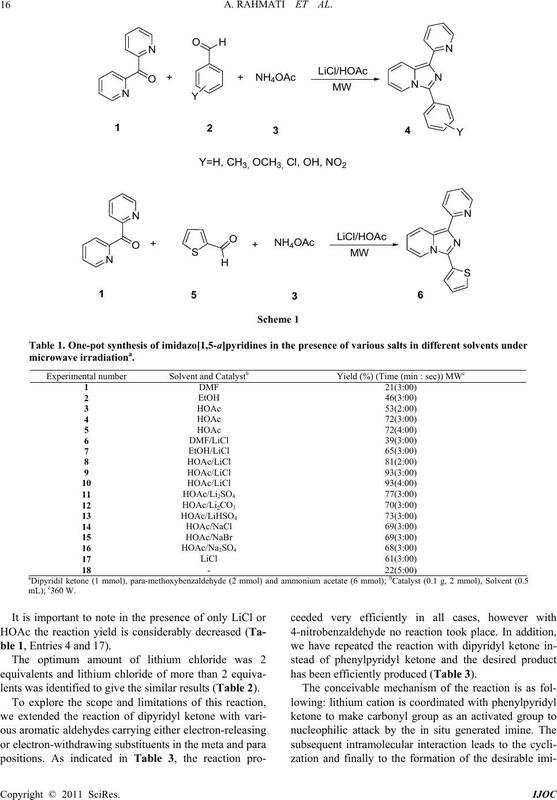 System,” The Journal of Organic Chemistry, Vol. 38, No. 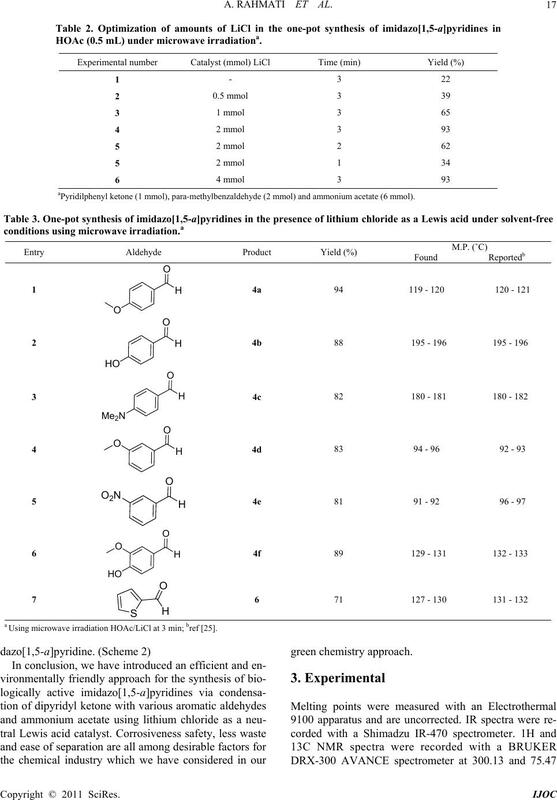 N. F. Ford, L. J. Browne, T. Campell, C. Gemenden, R. C.
Journal of Medical Chemistry, Vol. 28, No. 2, 1985, pp. 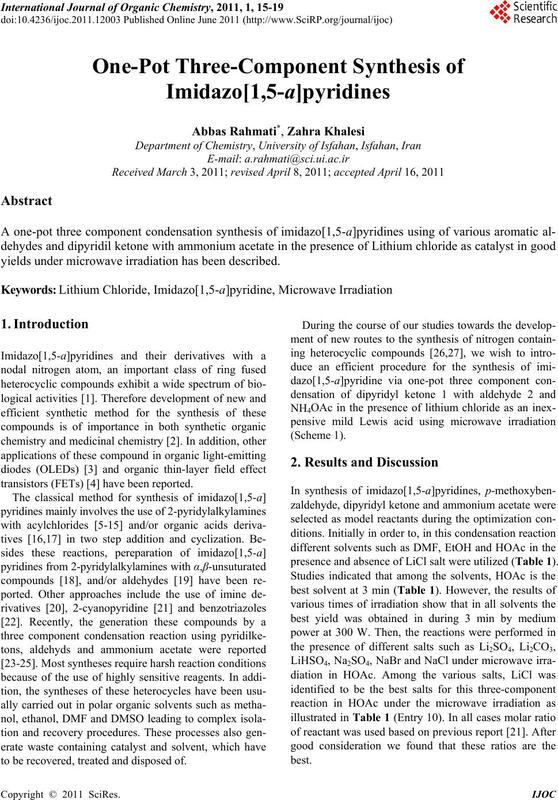 J. Bourdais and A.-M. E. Omar, “Polycyclic Azines. III. nal of Heterocyclic Chemistry, Vol. 17, No. 3, 1980, pp. Vol. 48, No. 5, 1998, pp. 1015-1022. J. A. Montgomery, J. A. Secrist, In: A. R. Katritzky, C.
Pergamon Press, Oxford, Vol. 5, 1984, p. 634.
dazo[1,5-a]pyridine,” Tetrahedron Letters, Vol. 31, No. L. J. Browne, C. Gude, H. Rodriguez, R. E. Steele and A.
cal Chemistry, Vol. 34, No. 2, 1991, pp. 725-736. Society, Perkin Transactions 1, No. 6, 1993, pp. 675-679. No. 24, 2006, pp. 5621-5624. D. Kim, L. Wang, J. J. Hale, C. L. Lynch, R. J. Budhu, M.
MacCoss, S. G. Mills, L. Malkowitz, S. L. Gould, J. A.
DeMartino, M. S. Springer, D. Hazuda, M. Miller, J.
Kessler, R. C. Hrin, G. Carver, A. Carella, K. Henry, J.
dicinal Chemistry Letters, Vol. 15, No. 8, 2005, pp. Edition, Vol. 41, No. 16, 2002, pp. 2962-2965.
ters, Vol. 27, No. 32, 1986, pp. 3713-3714.
nal of Organic Chemistry, Vol. 70, No. 6, 2005, pp. 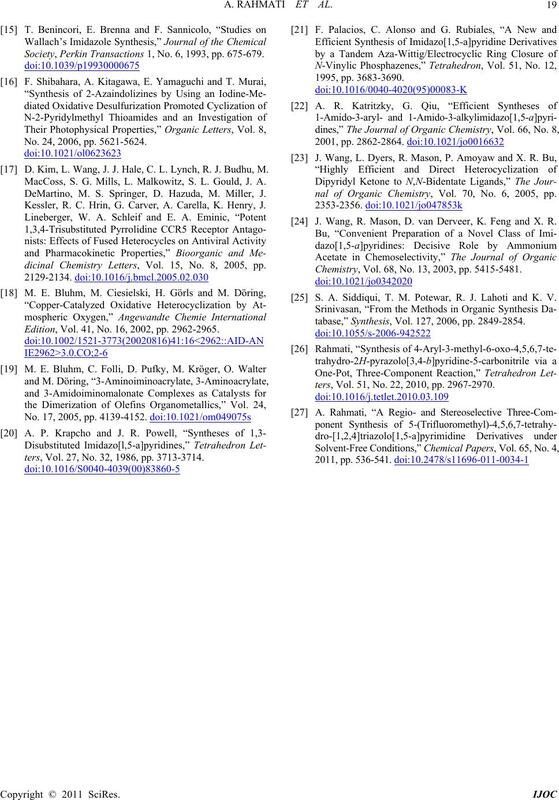 J. Wang, R. Mason, D. van Derveer, K. Feng and X. R.
Chemistry, Vol. 68, No. 13, 2003, pp. 5415-5481. S. A. Siddiqui, T. M. Potewar, R. J. Lahoti and K. V.
tabase,” Synthesis, Vol. 127, 2006, pp. 2849-2854.
ters, Vol. 51, No. 22, 2010, pp. 2967-2970.